Sydney is known for nightlife, trails, beaches, parks, and museums. 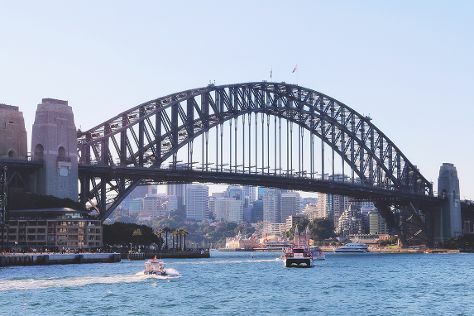 Your plan includes some of its best attractions: snap pictures at Sydney Harbour Bridge, see a show at Sydney Opera House, admire nature's wide array of creatures at Sea Life Sydney Aquarium, and enjoy the sand and surf at Manly Beach. To find ratings, other places to visit, and tourist information, you can read our Sydney journey planning site . Singapore, Singapore to Sydney is an approximately 10.5-hour flight. The time zone difference when traveling from Singapore to Sydney is 2 hours. Prepare for colder weather when traveling from Singapore in July: high temperatures in Sydney hover around 21°C and lows are around 9°C. Finish your sightseeing early on the 30th (Tue) to allow enough time to travel to Port Douglas. Spend the 31st (Wed) among aquatic life with a scuba or snorkeling tour. Spend the 2nd (Fri) spotting exotic species with a safari tour. There's still lots to do: look for all kinds of wild species at Hartley's Crocodile Adventures, look for gifts at With Sugar, don't miss a visit to St Mary’s by The Sea chapel, and learn about wildlife with up-close encounters at Wildlife Habitat Port Douglas. You can do a combination of flight and shuttle from Sydney to Port Douglas in 7 hours. Alternatively, you can drive; or do a combination of train and bus. Traveling from Sydney in July, things will get somewhat warmer in Port Douglas: highs are around 30°C and lows about 20°C. Wrap up your sightseeing on the 2nd (Fri) early enough to drive to Cairns. On the 3rd (Sat), discover the deep blue sea with a scuba or snorkeling tour. Here are some ideas for day two: take in nature's colorful creations at Botanical Gardens, then hike along Esplanade Boardwalk, and then have fun at Esplanade Lagoon Pool. To see other places to visit, ratings, more things to do, and tourist information, go to the Cairns itinerary builder website . Getting from Port Douglas to Cairns by car takes about 1.5 hours. Other options: take a bus; or take a shuttle. In August, daily temperatures in Cairns can reach 31°C, while at night they dip to 20°C. Finish your sightseeing early on the 4th (Sun) to allow enough time to travel back home.